Eleven year old Mandy Hope loves animals of all shapes and sizes and helps care for the critters in her parents’ veterinary clinic as well as outside the clinic too. One of these critters outside the clinic is the pregnant stray cat she found roaming in the school custodian’s garden she named Walton. However when Walton gives birth to her four kittens in Mr. Williams’s laundry basket instead of the nest Mandy built for her outside, he does not share Mandy’s love for the creatures. Rather he gives her one week to find the kittens homes before he takes matters into his own hands. With the deadline looming up ahead and no time to spare, Mandy and her best friend James must find suitable home for the kittens before it is too late. 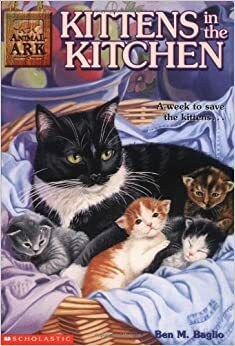 Those who share Mandy’s love for all animals should check out the 61 books that follow Kittens in the Kitchen in the Animal Ark series. These titles include but are not limited to Puppies in the Pantry, Lion by the Lake, Panda in the Park, and Gorilla in the Glade. Kittens in the Kitchen is a marvelous book for early readers and for those wanting a quick but engrossing story.